If you spend your work hours staring at a computer screen, your eyes may be too tired to read a book after hours. But that doesn’t mean you have to be bored during the commute to and from work. 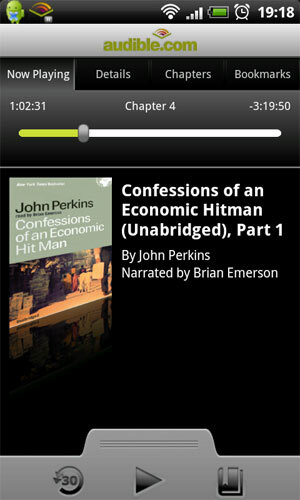 Audible recently launched a free Audible Android app to simplify access to the world’s largest selection of digital audiobooks (over 85,000 titles), from the fascinating true-life story ‘Confessions of an Economic Hitman’ to futuristic science fiction like ‘The Diamond Age’. When people talk about ebooks, the natural tendency is to discuss eInk devices like the Amazon Kindle and Borders Kobo or Tablet devices like the Apple iPad or Samsung Galaxy Tab which have iBooks/Amazon/Kobo eBook apps on them. Don’t forget digital audio books because they’re also a type of eBook. 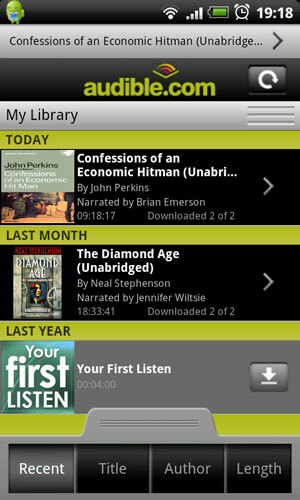 Audible also has apps for iPhone, iPod, Blackberry and some GPS devices as well as Android. I write short articles as well as long feature “explainer” articles on topics including: Google Android Smartphones and Tablets, National Broadband Network (NBN), Space, Civil & Military Aviation, Ebooks and the Publishing Industry, Electric cars, Technology augmenting human capabilities etc for Geare Magazine. The editor of GEARE has kindly permitted me to post articles here after the magazine issue the article was printed in has passed its shelf life. I have added updates where new information is relevant. Once you purchase books on the Audible website simply update your Audible library on your Android phone to download the new books (I strongly recommend doing this over Wi-Fi as lengthy audio books can be sizable files). The bookmarking system will keep track of where you left off listening to each book and resume from that point when you start playing again. If someone calls you while you’re listening to an Audible audio book it will smoothly pause and let the phone ring so you can answer the call without any issues. Audible often has introductory offers running – search online for promotional codes (or try offer code TWIT2), courtesy of the This Week in Tech podcast for a free trial period including credits to download two free audible books which you can keep even if you cancel the trial. 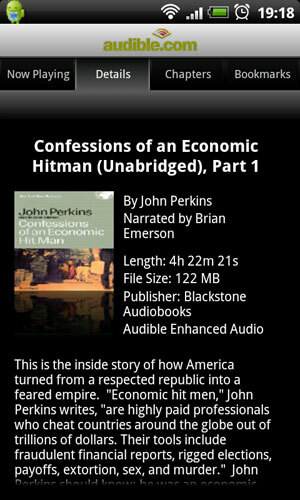 John Perkins should know – he was an economic hit man. His job was to convince countries that are strategically important to the U.S. – from Indonesia to Panama – to accept enormous loans for infrastructure development, and to make sure that the lucrative projects were contracted to U. S. corporations. Saddled with huge debts, these countries came under the control of the United States government, World Bank and other U.S.-dominated aid agencies that acted like loan sharks – dictating repayment terms and bullying foreign governments into submission. The Diamond Age by Neal Stephenson. In Snow Crash, Neal Stephenson took science fiction to dazzling new levels. Now, in The Diamond Age, he delivers another stunning tale. Set in twenty-first century Shanghai, it is the story of what happens when a state-of-the-art interactive device falls into the hands of a street urchin named Nell. Her life-and the entire future of humanity-is about to be decoded and reprogrammed…. A portion of this article was originally published in GEARE Magazine issue #64. It is “digitally reprinted” here with permission from the editor. I have added updates where new information is relevant. Man all this technology.. soon we will just be living in a little cocoon with all of our stimuli coming from a digital hookup. Pick up the book read it. Pull out and play those vinyl records. make time for the old tech too. What a brilliant app, I spend all day at my computer and my eyes are way too tired to read a book in the evening, so I end up just watching the box!